"Within the next 25 to 30 years, Dublin will have an established international reputation as one of the most sustainable, dynamic and resourceful city regions in Europe. Dublin, through the shared vision of its citizens and civic leaders, will be a beautiful, compact city, with a distinct character, a vibrant culture and a diverse, smart, green, innovation-based economy. It will a socially inclusive city of urban neighbourhoods, all connected by an exemplary public transport, cycling and walking system and interwoven with a quality bio-diverse, green space network. In short, the vision is for a capital city where people will seek to live, work and experience as a matter of choice" (Dublin City Development Plan 2011-2017, 2010, p.10). The plan promotes the idea of adopting a ‘public engagement and partnership approach’ as a way of working towards the ‘official sustainable future’. However, there are currently limited opportunities, as provided for under statute, for citizens to participate in the development of their city. Furthermore, where there are opportunities, they generally only allow people to participate in a reactionary manner, and not in an imaginative, deliberative or substantive capacity. Dublin City Council support some promising experimental collaborative city development initiatives, one such being ‘Designing Dublin: Learning to Learn’. They allocated staff to work on the initiative, and they provided them with working accommodation. It was partially publically funded, through the conduit of the Dublin Regional Authority. However, there was no independent academic researcher examining it, and very limited literature describing it. It provided a real world example of an approach for collaboratively developing Dublin in practice. Therefore, an exploratory study of the initiative was carried out as part of this PhD research. To achieve this aim, the creator of the initiative, the not-for-profit organisation, Design Twentyfirst Century, recruited a transdisciplinary team who used a design thinking process to develop prototypical projects, which all aimed to revitalise the city centre. The transdisciplinary team were made up of a mix of unpaid volunteers and seconded local authority staff, from a wide variety of backgrounds, and together they worked full-time on the initiative for a total of six months in a studio-type environment. They were guided through the design process by a creative director, and they co-developed solutions to address the declining city centre in creative collaboration with the local residents, businesses, organisations and local authorities. The emerging projects were also guided by a steering group made up of high level city officials who regularly provided their input and expertise. Through having carried out this research activity, in conjunction with having examined both the limited literature describing the project and the blog associated with the initiative, we developed a deep understanding of the initiative and created a ‘think description’ of it, thus illustrating how it worked in practice as opposed to in theory. A set of info-graphics were developed to communicate this understanding. A set of follow-up interviews were also carried out with high-level city officials to ascertain what the medium-term impact of the project was. This study confirms that the approach used by this initiative to collaboratively develop the city does offer some promise, although certain aspects of the approach need further consideration and development. 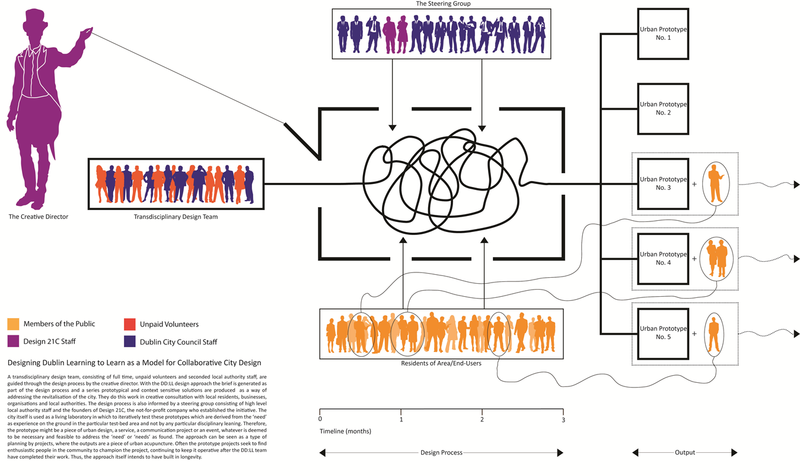 A full discussion of all these aspects is outside the scope of this page, although one promising strategy which the initiative championed for collaboratively developing the city by the initiative was prototyping. The idea of prototyping or testing a range of low-tech solutions to address a city in decline, prior to committing to more permanent implementation of such solutions appears to be a sensible approach, considering the current economic situation and the fact that is a resource-efficient strategy. Prototyping in the public realm also stimulates citizen engagement, and can be used as an accessible and democratic way to communicate possible future proposals to the public. Therefore, it is a practice that is worthy of further investigation and development. The research documented and developed an understanding of this experimental collaborative city development initiative, communicated this understanding through a written ‘thick descriptions’ and through a series of info-graphics and also uncovered the long term impact of the project. Additionally, it helped develop the practice of urban scale prototyping.